Yes, I have fond memories of Santa — not those that come out during the Christmas season on local street corners or those that listen to your Christmas wish list in almost every department store — no, my fond memories are of the “real” Santa Claus — the one who made sure that the men who worked as Santa impersonators to help Santa across the country and throughout the world were worthy of wearing the suit!!! His name was Charlie Howard (Charles W. Howard) and he lived in my home town! He was such a special person — belonged to our church and always had time to make a child’s day! He looked like Santa (even in a business suit) and his wife looked like Mrs. Claus — both were jolly and full of the Christmas spirit year round and always had big smiles and rosy cheeks!!! He opened and operated the very first official Santa Claus School in Albion, NY in 1937. His “barn” was a magical place for all of us as we grew up. We could visit the school, meet Santa himself, and pet real live reindeer (yes – real LIVE reindeer) – Rudolph, Dasher, Dancer, Prancer, Vixen, Donner, Blitzen, Cupid and Comet. There were trains and games and gifts and tons of fun things to do at the barn. We had no trouble at all believing there really was a Santa Claus and magical reindeer — we had proof — they lived in our town and were wonderful!!! We could see them whenever we wanted to, too – Christmas Park was open year round and children were always welcomed with open arms! An article I read to be sure I had my dates correct said that there was an estimated 40,000 visitors to the school each fall — people came from all over to see our special Santa and his school. I remember visiting the school as a wide-eyed child and finding something wonderful, exciting, and new each and every time — it never got old and was always so very special…… It is sad that the children of Albion can not enjoy that wondrous gift today! Charlie Howard was an incredible man. He felt that many Santa impersonators performed and looked poorly. He wanted to do something about it. The Santa Claus School he founded became world famous and men came from the world over to go through the rigorous lessons to become a certified Santa Claus and even receive a Bachelor of Santa Claus degree, if they met the additional requirements! None of the big department stores or organizations would hire anyone who didn’t graduate from the Charles W. Howard Santa Claus School. During his career, he worked at Macy’s as Santa-in-chief, appeared as Santa in the very first nationally televised Macy’s Thanksgiving Day Parade, and continued for the next 17 years. He was also a consultant for the 1947 film “Miracle on 34th Street“! He opened the Santa Claus School in 1937 and Christmas Park in 1953. He was a source of so many wonderful memories until he retired in 1965. In 1966, Charlie’s successors, Nate and Mary Ida Doan, took over the school. They kept the school in Albion, NY and commuted from their home in Bay City, Michigan until 1970 and then moved the school to Bay City. The current Dean of Santas is Thomas Valent – he took over in 1987 and moved the school to the current location in Midland, Michigan. I’m sure Mr. Valent is an excellent Santa teacher – the school is still going strong and people from around the world still view it as “the” place to become the perfect “Santa”. But I will always consider Charlie Howard as the one and only “real” Santa!!! Charlie has since left us, but he lives on in our hearts and in that sleigh pulled by those incredible reindeer. Together, they deliver gifts to children all over the world in just one magical night!!! I believe that……….do you??? 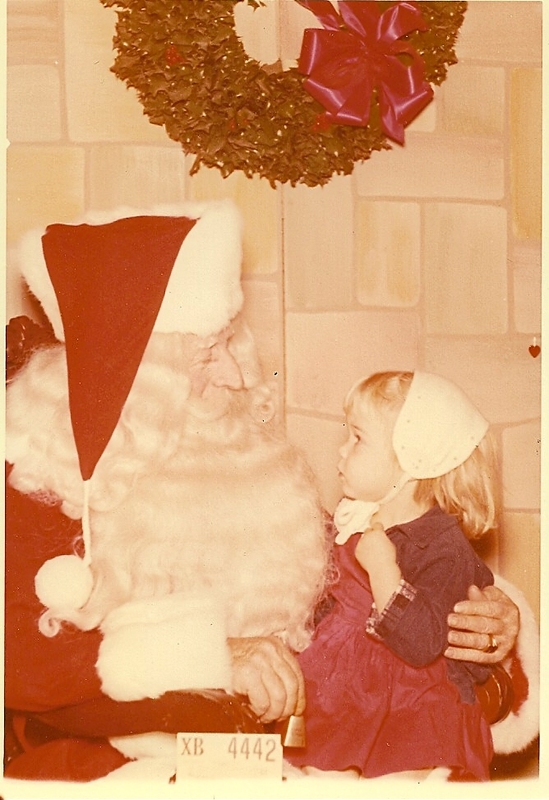 This is me with Santa at Christmas Park – I look like I was about 2, so this photo was likely taken in 1958. ← I can totally see Megan doing this…..